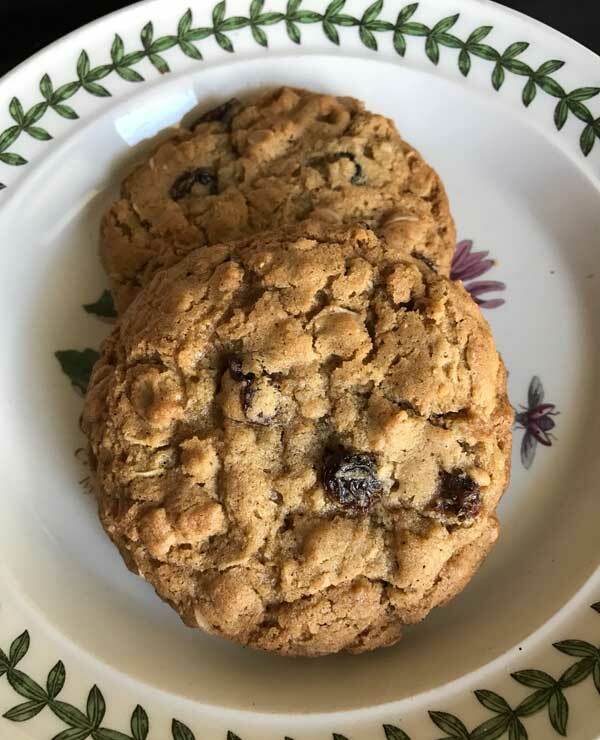 I have a lot of good oatmeal cookie recipes. In fact, I can’t pick a “best” because my favorites vary given my mood. 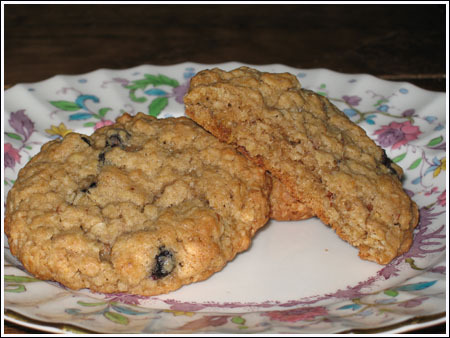 But for those of you looking for a reliable and tasty recipe for oatmeal cookies, this is a good one. 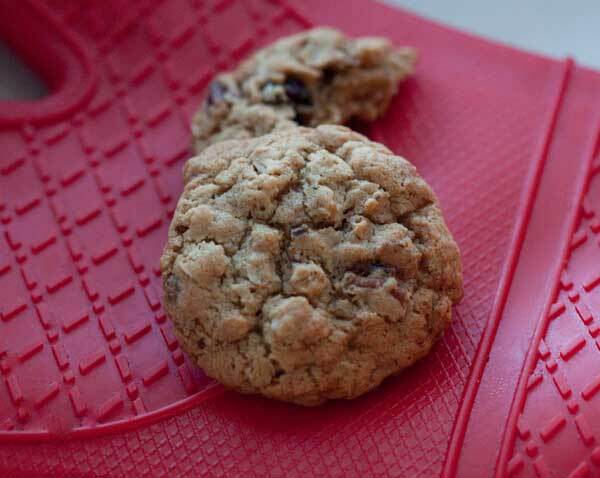 Part of what makes these oatmeal cookies so good is a combination of shortening and butter rather than just butter. If you’re not a fan of regular shortening, the new non-hydrogenated types such as Nutiva work really well. If you take the cookies out at 10 minutes (they’ll seem underbaked inside) and let them sit for a while, they have a very soft, dense middle. If you cook them for 12 minutes, they’re more uniform throughout. The ones in the picture were baked for 12 minutes. Chewy oatmeal cookies adapted from Crescent Dragonwagon's recipe. I always make these with raisins. Preheat oven to 375 degrees F. Have ready two parchment or foil lined baking sheets. If you haven't already done so, put the raisins in boiling water and let them soak for a few minutes. Drain and pat dry. In the bowl of a stand mixer with the paddle attached, beat the shortening, butter and both sugars until creamy. Add the eggs one at a time and beat just until incorporated. Beat in the vanilla and spices, then add the soda, baking powder and salt, mixing well so that all leavening agents are evenly dispersed. Add the flour and stir until blended, then add the oats, drained plumped raisins and toasted nuts. Using a generously heaping tablespoon (which will be more like 2 tablespoons), shape dough into balls. You should get about 40. put the dough balls in heavy duty zipper bags and chill until ready to bake or bake immediately. To bake the cookies, arrange dough balls about 2 1/2 inches apart and bake for 12-15 minutes. Let cool for 3 minute on baking sheets, then transfer to wire racks. Dried cranberries can stand in for the raisins if you prefer. I too love oatmeal cookies but can’t seem to find a recipe that comes out quite right. For some reason, mine always turn out like chocolate chip cookies that were made with raisins instead of chocolate chips, know what I mean? I’ll have to give these a try. I’m already encouraged by the photo – they look really yummy! Great recipe! I made them tonight minus the raisins and the nuts (for the boyfriend’s sake). They were a huge hit! Thanks again. Claire, I am happy to hear that you roast your nuts. It’s such a small thing, but so critical. Sometimes I feel bad for people who don’t like nuts in baked goods because I imagine that they’be been exposed to untoasted or unroasted nuts. Brenda, I always soak raisins. They tend to dry out if you don’t. There are some new raisins that are “pre-plumped” for baking. Those are great too. question–do you always soak your dried fruit before baking with it? Does it bring out the flavor? Just wondering. I have a big test week coming up next week, so studying is majorly in order…but I’m going to have to take a baking break! I’ve got recipes floating around in my head that I must try! I read your interview on that blog site preview thing and can totally understand you pecan delimma…aren’t those the only nuts in the world? BTW, thanks for the roasting nuts hint…I now roast my nuts before I put them in any baked good! So much better. I hate to admit it, but I really like these. They’re crunchy and hard and have a hint of coconut. Jen, I’d like to hear your opinion on how the two compare. Hmmm…I really liked those Jumbo Oatmeal Raisn Cookies (from Everyday Food) that you sent me so I’ll have to try these to compare.